Should you rent or buy skis and boots? For boots the position is much more clear cut than skis – basically, you almost certainly should buy your own boots once you’ve established that you enjoy skiing and will want to go again! The fundamental reason for this is the importance of getting a good fitting pair of ski boots. Firstly, badly fitted boots are seriously uncomfortable, and can lead to cold, painful feet and a ruined ski trip. Many beginners might actually be put off skiing by uncomfortable hire boots on their first trip, without realising that it is possible for your feet to be perfectly comfortable in a well fitted pair. Secondly, a well fitting pair of boots is absolutely essential as the interface between your legs and your skis – without the right boots, there is no point in spending time agonising over the side cut, length and size of a particular ski, as you won’t have the proper ability to control or benefit from the skis features. 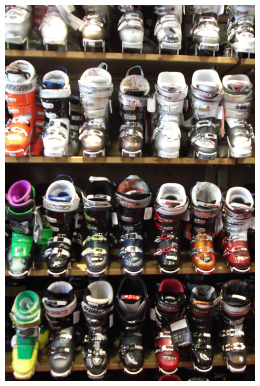 Next time you visit a ski hire shop, compare the boots they are renting out to those on sale on the other side of the shop. Most likely, the rentals will be plain black or grey plastic, and bear little resemblance to those you can buy, even though the manufacturers may be the same. This reveals a certain truth about the ski boot rental market – manufacturers make boots that are specifically designed for the hire market rather than for sale. These boots are designed to be worn by countless pairs of different feet throughout the season and, as a consequence, tend to be based on a “high volume” foot shape – i.e. they assume a foot that is wide and deep, in order to fit the widest range of people. Worse, the foam padding gets compressed down from repeated use, and so the only way to get the boot to fit closely is to yank down on the buckles, which can create painful tight spots. It’s also the case that people tend to rush getting fitted for hire boots, particularly on the first morning of a ski trip when the shop is busy and the snow is waiting! In contrast, when you buy boots you can (and should) spend several hours in the shop with an experienced boot fitter, who will measure your feet and advise you on which models will suit you best. Each manufacturer has a slightly different approach to foot sizing, so you may find that some makes and models just don’t work for your foot shape at all. As such, it is best to avoid going shopping with any pre-conceived notion of what boots you would like to come home with, and instead be guided by the boot fitter’s advice and what each boot feels like. A lot of boots now feature liners that can he heated up to mould to an individual’s foot and ankle shape. It’s also possible to “blow out” the plastic shell of boots in order to customise them to deal with particular issues, such as where there is a particular tight spot. It’s perfectly possible to get ski boots that fit comfortably and allow you all the control you need over the ski, and so you shouldn’t be satisfied until you reach that point! So buying boots is almost definitely a good move. Happily, boots are cheaper than skis (a decent pair tends to cost around $300-400) and will likely last quite a bit longer. They can also be packed much more easily into regular luggage, and so the compromises in relation to baggage allowances discussed below for skis do not apply. As such, while you should rent boots for your first ski trip, once you catch the bug and want to go again, get on and buy boots – you won’t regret it! 1). You get to know your own skis – by owning a pair of skis and skiing on them on multiple trips, you will get to know how they handle and get a real feel for how best to ski with them. Providing you’ve chosen your skis wisely (see our reviews here for help!) you should have a pair of skis that matches the kind of skiing you do. This is far better than the ‘luck of the draw’ approach that you can be faced with when renting skis. Also, your skis can be mounted with bindings that are set up just for your boots, rather than the “rainbow coloured” multi-adjustable rental bindings. 2). Owning is probably cheaper – we say “probably” as there are various costs associated with owning – namely maintenance and transport – which, depending on your situation, can start to whittle away the financial advantage. But even taking these into account, it is likely to be cheaper in the long run to own skis than to continue to rent them. Imagine a scenario where a skier takes 2 week-long ski trips a year, and buys a pair of skis costing $800. Let’s also assume that on one of those trips he faces a ski baggage surcharge (see below) of $80, and he also needs to service the skis once a year at a cost of $50. If the skis last for 4 years (and they may well last longer) his average cost per year is $330. In contrast, hiring decent skis is likely to cost $200 per week – $70 more per year in this example. However, if our skier in fact manages 3 trips or more, of keeps his skis for more than 4 years, or doesn’t need to lug them on an airplane, then the savings start to add up even more. 3). Less hassle when you get to the slopes – we’ve all been there – the first morning of a ski trip, there is fresh snow and the sun is glinting through the trees, but rather than being on the lift up, you’re hanging around in the rental shop waiting to get your hire skis (or worse, waiting for a friend to get theirs – no friends on a powder day!) With your own skis you can just clip in to the bindings and hop on the first lift. 4). It just looks cooler… – OK, so this shouldn’t really be a factor, but there is undeniably something cool about owning and using your own skis. Even just carrying them around on the way to the slopes makes you feel good! 1). Choose your ski for the conditions – If you buy skis, then unless you want to purchase (and carry around) a whole “quiver” of pairs, then you’re going to end up skiing your skis whatever the conditions. If you hire, then you can pick a ski that is suited to the snow you’ve got – a fat freeride ski if it dumps powder, or a carvy slalom ski if it’s boilerplate ice. Better still, you can potentially change the ski during the trip if the conditions change. With modern all-mountain skis (such as the Scott Crusade or Blizzard Bonafide), having only one ski for all conditions isn’t such a problem, but it is still something to bear in mind. 2). Less hassle and cost transporting skis – OK, we may think it looks cool toting skis around the place, but the fact it is can also be a hassle – they are long and unwieldy, and make getting on public transport and through airports more difficult. In addition, many airlines will now charge you extra for the privilege of travelling with skis. In addition, if your trip involves hiring a car at the airport to drive to the resort, you have to factor in either getting a car that is large enough to fit the skis inside with the passengers, or hiring a ski rack at an additional cost. This means that – at least for short trips weekend trips with flight supplements, it can sometimes be as cheap to rent skis as to buy them. 3). No need to worry about maintenance – with hire skis, you just hand them back at the end of the ski trip. If you own skis, then you’ll have to either budget for an edge and wax treatment every few weeks of skiing (depending on the conditions) or take the DIY approach of buying an iron, wax and an edging tool and look after them yourself. 4). 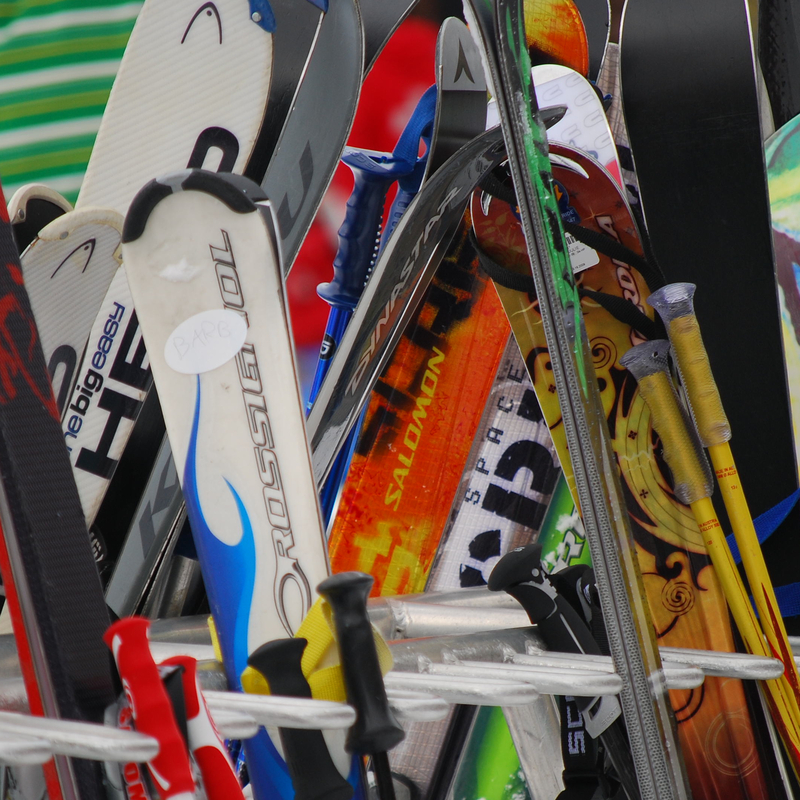 Always ski the latest models – if you’re paying to hire skis, then you should expect to be given that season’s skis (though this might not always be the case in smaller or cheaper hire outfits). In contrast, if you buy your own skis then you’re likely going to be skiing them for 4 years or more, and at the end of their life, they’re probably going to be looking and feeling a bit tired. But then again, by that point you’ll have saved enough in not paying rental fees to buy a shiny new pair, and your trusty old skis can become a pair you use for early or late season skiing when the snow conditions are less optimal. So, that is our view of the pros and cons of renting and buying. On balance, we think for most keen skiers the benefits of buying skis probably outweighs the negatives, though if you only ever ski on short breaks and using low cost airlines then you may decide differently.